3.4 The balance of public finances. 4 Magic square, but why? 9.0.5 Growth and balance of current transactions. The magic square, invented by Nicholas KALDOR (1908-1986), to define the 4 main points of the economic policy d´un countries. 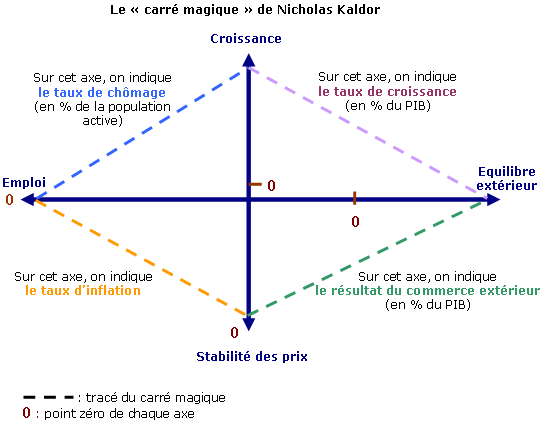 At the crossroads between real economy and financial economics, magic square, invented by Nicholas KALDOR (1908-1986), British Economist of post-keynesien current, to define the main points of the economic policy d´un countries. In 1960, British Economist Nicholas Kaldor speculated to represent by a simple geometric figure the objective of balanced growth. This representation originally intended to ease the introduction of the "performance" of the economies of the OECD has been a great success and it is designated by the expression of "magic square" to emphasize how the simultaneous achievement of the 4 goals takes the magic. It is by joining the four points, obtained a quadrilateral representing then of all the more favourable economic situation that this quad is near d´un square. By connecting four points on each axis, we obtain a quadrangle: more the surface is large, the more the economic health of the country. Important clarification, however: scales of the rates of inflation and the unemployment rate must be reversed, the objectives being to reach 0% on each of these axes (see an example above). Stabilize prices is to avoid inflation and possibly deflation. If this goal has long was less monitored that full employment is because in closed economy, inflation is not the same observable consequences and open economy. International competition requires the gap of inflation with major trading partners to avoid losing market share. Domestic inflation does not touch the different components of the population in the same way: holders of fixed income (pensioners including pensioners) and more generally the lenders such as banks, are affected negatively, however those who can borrow and have a wage for example index on prices are winners. Grandpa boomer have for example greatly earned as this. The construction of economic and Monetary Union has made the fight against inflation the only objective assigned permanently to the European Central Bank. However even if it wants to reduce unemployment it should never say for reasons of efficiency because it is more effective if people think that it is wrong to do but is still as if people think that she is going to do something and the fact. The macroeconomic inflation target is formula, and is measured in terms of a target value of the general price index, expressed as a percentage of annual increase of it. In the case of the euro area, the target is set at 2% that are considered SAS the ideal rate, so when the inflation rate is close to this threshold, the ECB must take monetary policy measures to reduce the growth of the monetary mass to not feed inflationary pressures. "Full employment" means the lowest possible unemployment rate, because the unemployment rate can not be null. There are permanent destruction and the creation of jobs and the passage of each other is neither automatic nor immediate. The structures of the productive apparatus and institutions that organize the functioning of the labour market translates into rigidities more or less important that explain the permanent presence of discrepancies between supply and demand for labour. The incompressible unemployment rate is often referred to as "structural unemployment rate". Wanting to have full employment is to seek to bring the effective rate of structural unemployment unemployment rate and try to reduce it as much as it is possible to do so. Some politicians have sometimes raised the possibility to include the "right to work" in a new declaration of the rights of man (preamble to the Constitution of 1946). As early as 1945, in the Charter of the United Nations, Member States committed themselves to act, together and individually, to achieve full employment in their respective economies. In 1992 the Maastricht Treaty in its article 2, provided for mission to the European Community "to promote a[…] high level of employment". If the goal of full employment is displayed by all Governments is for social reasons (taking into account the plight of those who want to work) and economic (do not use all the available work is waste and loss of property be collective). The number of jobseekers metropolitan France. In France (including Dom), the number of unemployed totalled 3 850 900 in category A (+ 1.1% over one month, + 3.5% year on year) and 5 740 600 for categories A, B, C (+ 0.2% over one month, + 5.3% year on year). A positive trade balance means that the country exports more goods and services than it imports: referred to as "surplus" or "balance surplus. When it is negative, we talk about "trade deficit". The balance of trade may be problematic, this is due to the difficulty of the registration of all commercial data. An illustration of this problem is as follows: when all the deficits and trade surpluses are added up, it appears that the world records a trade surplus with itself, by a few points. This may be the case, because all the transactions are either a credit or a debit in the account of each country and should therefore be balanced. An explanation for this phenomenon may lie in transactions to wash dirty money, or other problems yet. If neither the surplus nor the trade deficit are dangerous for a national economy, they may however be the sign and the cause of other economic problems (in case of deficit: weakness of the industry, overvaluation of the currency promoting goods imported versus indigenous production; or vice versa in case of excess, probable or undervaluation of the currency allowing foreigners to buy low-priced industrial tool of the country). To assess the situation of a country from the rest of the world (evolution of savings and debt, share capital from abroad or on the contrary abroad…), the balance of trade is not enough: it is a component of the current account, itself part of the balance of payments. So for example a very tourist country can have a deficit trade balance and a positive current balance (if expenditures of tourists pay more than the excess of imports over exports). Economic relations between residents of the country and the strange country influence the macroeconomic balance. The balance of current transactions translates of inflows or outflows of foreign currency. These movements affect foreign exchange reserves and the formation of the exchange rate. When the value of imports exceeds that of exports (deficit) the national currency is less requested and its price (in foreign currency), that economists call its exchange rate, will drop. This makes imports more costly if they are paid in foreign currency and on the other hand this reduces the recipe of exports. The results of residents who exchange with non residents are deteriorating. relocation or conversely the relocation of domestic firms. A trade is mutually beneficial to the partners, and involves an enrichment for both; the words "excess" and "deficit" are therefore inappropriate inasmuch as they respectively imply an enrichment and an impoverishment. They appeared under the mercantilism doctrine that it is better to export goods (acquisition of currency against property) instead of in importer2. They have survived by tradition and persistence of the mercantilist (including via Keynesianism) doctrine. Note that Frédéric Bastiat, the deficit decreased in the period of recession and increases in periods of expansion. The trade balance deficit is a problem for the State's economy, it creates unemployment. Need to fix a public policy of protectionism. The balance of public finances. If it is impossible that a Government takes lasting more that he spends except by using the windsurfing ticket (so make inflation), a sustainable budget deficit and importantly becomes a handicap. Indeed the State eventually make debt to pay the old debt. As we must finance the deficit affected Governments must borrow which means that they must pay interest. If the rate of GDP growth is less than the interest rate, debt increases mechanically (Conversely, if the interest rate is lower than the rate of growth of GDP, the debt decreases automatically). Politically the Maastricht Treaty and the Amsterdam Treaty require eurozone governments to meet thresholds for all public administrations respectively to 3% for the report of the public deficit to GDP and 60 percent public debt to the GDP report. Because economic growth measures the sustainable increase of GDP per capita it is the condition of the improvement of the standard of living if the price increases more slowly than GDP. So it is the growth of real GDP (GDP purchasing power) that is sought. A higher level of life expands consumer choice and allows changes to lifestyle. In fact amount that represents nothing because the purchasing account. More numerous criteria on the measurement of growth are subject to debate. Indeed it is easy d ' show growth strong resulting property (destruction forests, pollution of Lakes etc). A quick overview of the sources of growth shows that public intervention can contribute to increase the pace. Another way to increase productivity is to improve the efficiency of labour and capital, referred to as intensive growth (Act on the productivity of labour and capital). Governments can lead training policies, support expenditures for research and development, and innovation. But it's the structural determinants of growth. Governments may also wish to act on cyclical developments by practicing recovery in the event of recession or stabilization policies when inflation becomes excessive. The level of redistribution on the basis of the populations also great debate. Since the 1990s, economists have decided to add a 5th element, making appear a Pentagon: the sustainability of debt, which cannot be reduced to simple convergence criteria (budget deficit below 3% of GDP and public debt below 60% of GDP). This square is called a 'magical' car, according to Kaldor, it is impossible to achieve these four goals simultaneously. Indeed, for example, according to the Phillips curve (see another of my articles), it is not possible to simultaneously have an unemployment rate and a low inflation rate, these two attributes being negatively correlated. Growth and unemployment however correlate positively as the disinflation and budgetary l´equilibre. Politically the magic square is very important, because it allows to see who is the big winner in politics. During the Trente Glorieuses, for example, the main purpose of the RFA was to maintain low inflation, while in France the growth and employment were the main objectives. Now we want above all not too d´inflation. This will therefore benefit a certain category of population at the other d´une expense. Governing is choosing. In a democracy, the public authorities are at the service of the interests expressed by the citizens during the elections. Political power normally strives to act in accordance with this expression by transforming the individual wishes in collective project. It is necessary that the workforce either used with a high employment rate and a low unemployment rate, but also that the price level does not increase too quickly. It is also a political choice. In theory the right would still be for the fight against inflation. The left preferring the fight against unemployment. As for the State and households, the low inflation is bad news for indebted companies. Difficult, even for those who have little debt, maintain their profitability if their turnover has stagnated, due to selling price at half-mast. "Companies are reluctant to invest and hire", concludes Philippe Waechter, d´ou unable to d´avoir the two elements work for all and low inflation simultaneously. This low inflation however greatly advantage the annuitants (major political force, because pensioners are often retirees). I say that pensioners are often retirees, because have an annuity requires a capital and to create this often asked ud time. The trade balance is rather correct. Inflation causes mainly: rising prices and the increase of interest rates (which discourages investment). This affects the value of the currency (the currency depreciation), so in terms of Exchange, we pay with currency more imports and exports reported less. It was a deficit in the trade balance. In general there is growth and declining unemployment. More it l´inflation y more growth there or vice versa, more there is growth more prices are increasing. As you've surely heard about there is growth we must recruit, who says recruiting said drop in the unemployment rate. With strong as inflation, employees are very advantaged because inflation is not a bad thing. It allows to reduce the burden of debt and public deficit as well as households, result in wages, so giving back some bargaining power to employees and to transfer wealth from savers to borrowers, old to young people. Pensioners and the owners, c´est-IE in general d´un people older are injured. Note that retirement is an annuity. A period of strong expansion is generally inflationary and unemployment is low, conversely a recessionary period is characterized by a high unemployment rate and normally low inflation. It happened however that conditions translates into a combination of a high inflation and unemployment rates also important: we talk of stagflation. The binding is firstly a simple multiplication, the production can be calculated as the multiplication of the number of hours of employee work and productivity per hour. If in one hour of work carried out production worth 10 euros and employee workload represents 100 hours, so production worth 1000 euros. In theory a 2% GDP growth leads to an equivalent employee workforce increase or 2% with an hourly productivity and the working hours unchanged. Actually the link is not as obvious because the labour productivity depends on the intensity of the work and that it varies with the growth of production. More beyond a certain number of hours an employee becomes less productive per hour (fatigue). There is also a cycle of productivity. When the rate of GDP growth decreases, firms do not immediately adjust staffing, they vary the hours of work (hours sup, a.i. and hiring) and more rarely the intensity of work. Indeed, when there are no clients the company often prefers to lay off but she often want to keep a high productivity (time is money), but productivity per worker will anyway one can decrease. Conversely in a situation of recovery, companies do not increase immediately employment. At first they use the employees longer and more intensely (often by investing in equipment), productivity per worker increases. There is thus a lag between changes in production and employment. To meet variation in product demand enterprises can vary employment, they can also choose to use more capital. Because in the short term the price of capital and productivity change much, and that the substitution of capital for labour depends on relative prices (wages and the price of equipment are corrected by the productivity) of two factors of production, development of nominal salary, the general level of prices (inflation) and the productivity of work disturb the relationship between production and employment. It is not enough that the production increases so that employment is increasing. Finally, the globalization of production often results in relocations that weaken further the link between GDP growth and jobs (national territory). The evolution of employment does not directly determine that unemployment. Unemployment is the difference between the number of jobs and the workforce (those who have a job and those seeking in a). Employment is the work request by companies to the labour market on which are the assets that make a job offer. It is for this reason that there is a 'labour market'. The active population is not entirely exogenous, its evolution is also depends on the economic situation. When unemployment is very important some workers are discouraged and withdraw from the labour market or are expelled from the statistics, activity decreased thereby reducing all unemployment measured; We talk of bending of the activity. When growth becomes stronger, these discouraged workers return to the labour market, the participation rate increases, and unemployment did not decrease as much as it should. A job more isn't necessarily an unemployed less. Inflation is the General level self-sustained increase of prices, in other words how much you pay more to buy the same thing. Creative destruction (appearance and disappearance of activities productive) resulting from innovations (of product, process or organizational) upsets the price system. Although; I invite you to see my article on robots. All prices are unstable because they reflect the tensions between offers and requests for goods and services. Just a bad season, an artificial shortage (professional to say limited edition language) and the price climbs. In addition to this distortion of the price system, observation shows that the general level of prices, calculated as a weighted of all the price index evolves him also. So since the second world war the price index increases each year, more or less, except in periods of recession strong (they were very rare). There is a positive link between GDP growth and inflation rate. Economic growth may give rise to tensions on the use of productive resources, the work of course but also raw materials and energy (ecology). These tensions lead to increased nominal wages and prices of commodity (e.g. oil depletion). For nominal wages should be added that, in a period of growth, unemployment is low and employees are in a position of strength to negotiate increases. One then speaks of inflation by the costs. But economic growth can also be the source of inflation by the application. The growth of production is also the revenue growth and this allows an increase in the demand for products. The population may also increase, so pay attention to the raw values or values per capita. The latter can also be powered through the credit (creation of money by banks). If supply reacts with delay because all production capacities are used the commodity prices will increase. It is essential to understand that if the request and costs can be sources of inflation, the necessary condition for inflation occurs is the increase in the quantity of money in circulation (the money). For this money by the credit creation is very effective. It is during the late 1950s that Nicholas Kaldor chose to represent economic performance by the "magic square" and he presents what he calls "the six stylized growth facts". Observation of the growth rate fluctuations make sure the unemployment rate decrease and the price index increases when accelerates economic growth (expansion) and conversely, the slowdown in economic growth is accompanied by an increase in the rate of unemployment and a reduction of inflation. In the early 1960s "Phillips curve" establishes a negative statistical relationship between the rate of growth of nominal wages and the unemployment rate. When unemployment is low, nominal wages are increasing rapidly, and conversely, high unemployment slows the increase in nominal wages. The relationship is quickly transformed by replacing the nominal wage growth of prices. The Phillips curve becomes a relationship "inflation-unemployment" that can be interpreted as a choice: more unemployed to have less inflation or more inflation to have fewer unemployed. This relationship played a very important role in the definition of policies. Cyclical economic policy becomes simple because you must choose between two objectives: inflationary growth ensuring full employment and price stability but with insufficient growth to ensure full employment. Governments could then carry out policies of stabilization (stop) and (go) recovery policies. Because the inflation-unemployment relationship gives arguments to defenders of the role of the State as driver of the economy, it has therefore been particularly discussed. If all economists agree that long term there is no relationship of Phillips (the level of production of full employment is dependent on or the level of prices or to its variation) in contrast to the short term the issue will not be decided. Since economic growth is made possible by the increase in numbers, the stock of capital and of labour and capital productivity, there is a growth rate that can be deducted by the calculation from the evolution numbers (fixed duration of work), investment (corrected by the degree of use equipment) and productivity. This theoretical growth is growth potential. It is possible to statistically identify the trend of evolution of GDP. This trend growth is comparable to potential growth. Of course, actual GDP departs from potential GDP under the effect of demand shocks and supply suffered by the economy. The gap between potential and actual growth is the cyclical component of growth. To illustrate here two estimates of the output (output-gap) gap between actual growth and potential growth and to learn more on this notion of potential growth and its use to explain unemployment. The gap between actual unemployment rate and the rate of frictional unemployment is unemployment on which it is possible to act. It contains two components: a cyclic part depending on the economic situation and a relatively stable part. Cyclical unemployment thus complements structural unemployment. The rate of structural unemployment is the unemployment rate which would exist in the absence of economic shocks (in this case it contains the rate of frictional unemployment). It is directly related to the potential or trend GDP growth rate. It is where the distinctions between structural unemployment, natural rate of unemployment and unemployment rate of balance presented and summarized by this schema. Growth and balance of current transactions. Economic policy in a country that participates in a fixed exchange system can face external challenges which may be important. This is the case where economic growth is accompanied by an increase in imports that is not matched by exports. This corresponds to a specialization of the productive unit which is not well suited to domestic demand (must be imported to meet this demand) or / and external demand. This may be the case if the country does not produce a critical resource (oil) while it strongly uses the car. The external account deficit increase translates currency outflows, the Government must defend the exchange rate level in making sales of currency against its currency. When this is possible because the exchange reserves are empty, must be to devalue and adopt a new exchange rate. This only in Exchange system fixes. By agreeing to participate in the European monetary system the France is imposed the duty to defend the value of the franc relatively to the other currencies of the system particularly the German mark. The experience of driving stimulus policy in 1981 showed that a significant increase in household demand supported by an increase in spending public training a net deterioration in the external balance. Furthermore, when capital can move freely from one country to another, which is the case for France since the abandonment of the exchange control it is impossible both driving an 'autonomous' monetary policy and a fixed exchange rate policy. 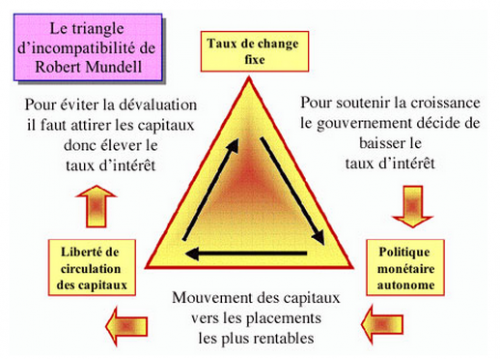 Robert Mundell is a schematic representation of this triangle of incompatibility. The simultaneous success of these 4 objectives would be impossible, and would be a sort of squaring the circle, where the magic character of the square. In practice, it would be forced to prioritize its objectives and the square would look like anything but a square. The only example of the FRG from 1949 to 1989 just a demonstrate: governed by the principles of the ordo-liberalism, the RFA then managed to reconcile strong growth, low unemployment, controlled inflation and the current account surplus. This is when it deviated from its principles that she was able to find, from the oil shocks, less good performance, but who do not call in question the fact that the square has no magic. Note, however, that the fall of the wall, the country was poor. Magic square is a very interesting concept and sometimes it was borrowed in management games to simulate the difficulty of the management of a country. Indeed, it is almost impossible d´avoir all the statistics in the Green well qu´il be possible to s´en approach.